The University of Alabama Center for Economic Development delivered books to Marengo County in 2018. TUSCALOOSA, Ala. — The University of Alabama Center for Economic Development will hold its 14th Books for the Alabama Black Belt drive from Monday, Jan. 21, to Monday, Feb. 18. UA students, faculty and staff, as well as people in the community, may donate new or gently used classic and award-winning books found on school reading lists for K-12 children in the Black Belt. A list of appropriate books appears at the center’s Web site: http://www.uaced.ua.edu/books-for-the-black-belt.html . Donation boxes will be in Bidgood Hall, Gorgas Library, Nott Hall, Doster Hall, the Center for Service and Leadership (Ferguson Center Room 1100), Smith Hall, and the Mildred Westervelt Warner Transportation Museum. Books also may be dropped off at UACED, 621 Greensboro Ave. 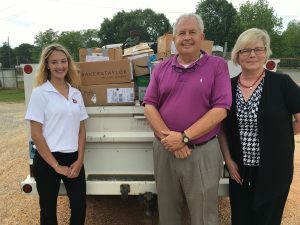 The campaign brings books to students in Bullock, Butler, Choctaw, Dallas, Greene, Hale, Lowndes, Macon, Marengo, Pickens, Perry, Sumter and Wilcox counties. The goal of the drive is to provide one book for each child in the Black Belt counties. The center will distribute the books to schools in late spring. For more information about the book campaign, contact Sally Brown at 205-348-8344 or uced@ua.edu. Sponsors of the 2019 campaign include the Culverhouse College of Commerce, Gorgas Library, UA’s Honors College, the Tuscaloosa Public Library, UA Center for Economic Development and UA Museums.